Many people have great back yards but don't have a place to to sit and enjoy it. Preventive maintenance Support Services will fix this. In this case, we excavated the area next to the house and formed for a new concrete slab. 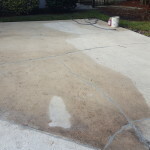 We take a lot of care doing this and make sure the new slab is lower than the homes and/or we make sure to slope the new concrete patio deck away form the house. These measure make sure that water does not collect at the connection and possibly leak into the home. If you hire someone to do this and they don't take this precaution, damage to your floors and even mold may grow. Depending on how much concrete is needed for the new back porch patio concrete deck, we either hand mix or call in for a truck load of concrete. Many ties we need to also bring in a concrete pump in order to get the concrete required for the new deck in place. Finally we provide a finish for the new concrete. There are many concrete finished available. 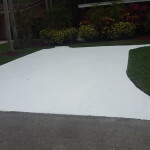 A simple smooth or broom swept concrete finish is popular. 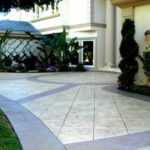 Other more complex decorative concrete is also available. there are many to choose from. We can stamp the concrete, we can texture the new concrete, texture concrete is very attractive and, very cost effective. 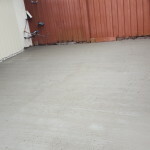 And we can also simply stain the new concrete. If someone wants a long term decorative concrete we can actually color the concrete before we pour ir. So if you want a new and beautiful new decorative concrete deck call us today.